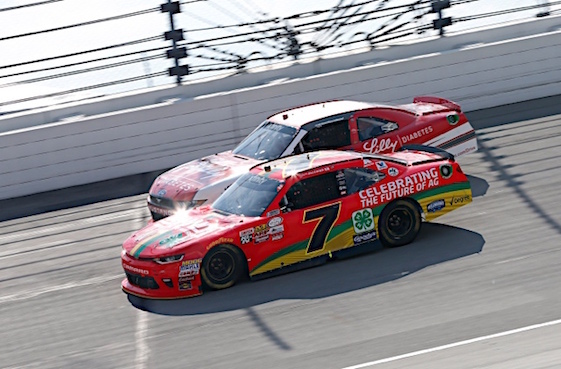 Grabbing the lead with a bold move to the inside after a restart on Lap 186 of 200, Justin Allgaier, an Illinois native, captured the victory in Saturday’s TheHouse.com 300 NASCAR Xfinity Series regular-season finale at Chicagoland Speedway. Brendan Gaughan rallied from three laps down to finish 13th on the lead lap and nail down the final spot in the playoffs. (14) Justin Allgaier, Chevrolet, 200. (3) Kyle Larson(i), Chevrolet, 200. (6) Elliott Sadler, Chevrolet, 200. (9) Daniel Hemric #, Chevrolet, 200. (13) Austin Dillon(i), Chevrolet, 200. (7) Matt Tifft #, Toyota, 200. (5) Cole Custer #, Ford, 200. (17) Ty Dillon(i), Chevrolet, 200. (11) Blake Koch, Chevrolet, 200. (12) Brennan Poole, Chevrolet, 200. (15) Brandon Jones, Chevrolet, 200. (19) Brendan Gaughan, Chevrolet, 200. (20) Dakoda Armstrong, Toyota, 200. (1) Erik Jones(i), Toyota, 200. (2) Daniel Suarez(i), Toyota, 199. (23) Jeremy Clements, Chevrolet, 199. (34) David Starr, Chevrolet, 197. (21) Ross Chastain, Chevrolet, 196. (22) Ryan Sieg, Chevrolet, 196. (27) Harrison Rhodes, Chevrolet, 196. (4) Ryan Blaney(i), Ford, 196. (29) Joey Gase, Chevrolet, 196. (37) Spencer Boyd, Chevrolet, 194. (31) Vinnie Miller, Chevrolet, 193. (35) Chris Cockrum, Chevrolet, 193. (32) Mario Gosselin, Chevrolet, 184. (39) Mike Harmon, Dodge, 184. (8) William Byron #, Chevrolet, Transmission, 166. (30) Josh Bilicki, Chevrolet, Electrical, 152. (26) BJ McLeod, Chevrolet, Engine, 86. (28) Timmy Hill, Dodge, Vibration, 33. (33) Garrett Smithley, Toyota, Engine, 24. (38) Morgan Shepherd, Chevrolet, Handling, 23. (36) Jeff Green, Chevrolet, Brakes, 8. (40) Matt Mills(i), Chevrolet, Vibration, 3. Average Speed of Race Winner: 133.218 mph. Time of Race: 02 Hrs, 15 Mins, 07 Secs. Margin of Victory: 1.772 Seconds. Lap Leaders: E. Jones(i) 1-47; C. Custer # 48; E. Jones(i) 49-92; C. Custer # 93-130; K. Larson(i) 131-145; C. Custer # 146; K. Larson(i) 147-151; C. Custer # 152; K. Larson(i) 153-154; R. Blaney(i) 155-182; E. Jones(i) 183-185; J. Allgaier 186-200. Leaders Summary (Driver, Times Lead, Laps Led): E. Jones(i) 3 times for 94 laps; C. Custer # 4 times for 41 laps; R. Blaney(i) 1 time for 28 laps; K. Larson(i) 3 times for 22 laps; J. Allgaier 1 time for 15 laps.